HOPE is the result of the indwelling life of Christ lived out every day for the people that Shepherd’s HOPE was brought to Englewood to serve. Thank you for your prayers and financial support. Without these, the stories of HOPE would never come to fruition. In 2008, before we actually started serving this community, the LORD laid out a 5-step plan for this ministry. Step 1: Combat physical hunger. We are accomplishing this through 2 venues – our Food Pantry at 5732 S Lowe Ave and The Family Feeding Center at 6455 S Peoria. The simple act of kindness of providing food and hot meals to those in need lets us develop hundreds of relationships with the people of this community. Step 2: Combat lack of spiritual awareness. We are accomplishing this through Friday evening outreaches, weekly bible studies on Tuesdays, Wednesdays and Saturdays and church services on Friday afternoon and Sunday. These services are led by 3 men who faithfully minister to this community. Pastor Dwayne Grant joined our team to provide sermons on Friday during the noon to 2:00 pm Family Feeding Center hours. He also does a Friday evening outreach ministry on the street at 67th and Halsted, as well as Sunday church services and Tuesday evening bible studies at the McDonalds at 69th and Lafayette. Apostle Nathaniel Hill is a Shepherd’s HOPE board member who preaches for Sunday Services at 11:00 am and leads Wednesday evening bible studies at 6455 S Peoria. Board Member Kevin Johanson has facilitated a bible study for the past 5 years in the basement of St Stephens Church at 910 W 65th Street on Saturday mornings. This is a great team of men who are truly devoted to the LORD. I feel honored just to serve with this group. Step 3: Combat educational and vocational deficiencies. This is the next step of our journey. But to even begin to meet this goal, we need a facility where we can bring all that we already do under one roof and allow for the expansion plans required for steps 3, 4 and 5. The LORD has brought such a building into our midst. It is a 55,000 sq ft elementary school with a 320 seat auditorium, a large gymnasium, and a kitchen with lunchroom. 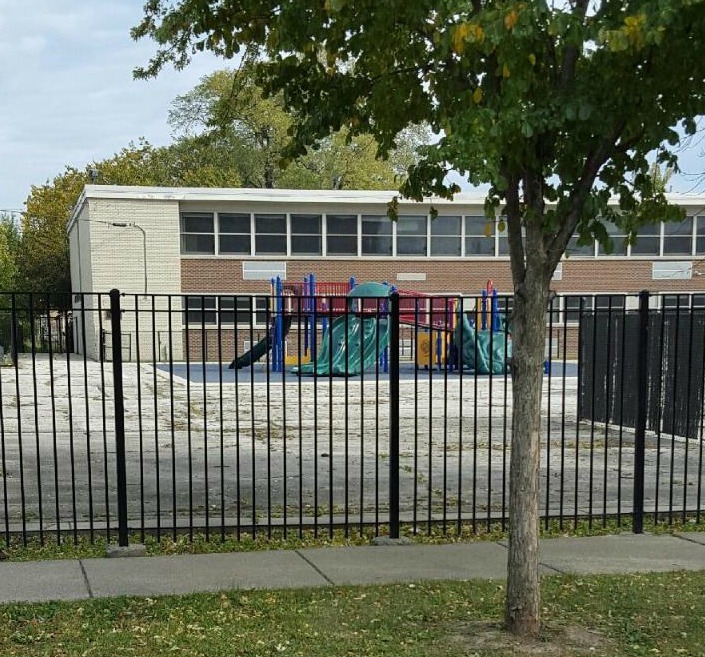 Bernard Mays Elementary school, which has been closed for over 7 years, is located at 838 Marquette Rd and is just 2 blocks from the current Family Feeding Center. Mays is an adequate facility to move all of our existing programs and add after-school tutoring programs, GED classes, after school athletic programs as well as vocational training. We have a ministry, Life Leadership, that has shown a willingness to walk with us on this journey financially as well as to provide guidance, training, and jobs for this community. What a blessing! The prayers we need are in reference to a meeting scheduled with Alderman Rod Sawyer on November 3 at 11:00 am. We need Alderman Sawyer’s blessing if we are to make Mays School a reality for Shepherd’s HOPE. Please pray for GOD’s hand to be present in this meeting and GOD’s will to be done. Your prayers mean a great deal to us. You, our financial supporters, have been the catalyst that have brought us this far, with GOD’s strong guiding hand and HIS additional resources it all came together. At this time we need your prayers more than ever. But please don’t forget us financially; your continued support is needed if the communities we serve are to continue to enjoy the shining light that Shepherd’s HOPE has brought to this dark and devastated area of Chicago. To you it may look like a blip on the map, but if you were to ever walk in this community that we serve, you would be able to see and feel of JESUS CHRIST shining brightly – only because of your prayers and financial support. The next step in the LORD’s plan is to extend a helping hand to the youth and teens of this community. We continue to seek assistance from other sources as well. In October we received a grant of $15,000 from The Chicago Community Trust to help with our operating expenses and we are actively pursuing three other funding sources that have expressed interest in helping Shepherd’s HOPE – in addition to Life Leadership. However, your ongoing financial support remains essential to meet current expenses and to help lay the foundation for the future vision of Shepherd’s HOPE. Thank you again for all your support in prayer and financial support. This building will provide Shepherd’s HOPE the space to not only physically and spiritually feed the people we serve, but also to use this facility to provide for the educational deficiency of this community’s youth, teens and adults. After school athletic programs and vocational training will also be provided which will improve the ability for individuals to provide for their families and contribute to their community. If this building is made available all the LORD’s plans for this community can become a reality. ONLY GOD!